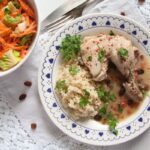 Wonderfully tender chicken pieces in a velvety and delicate white sauce with raisins – a Saxon chicken recipe. 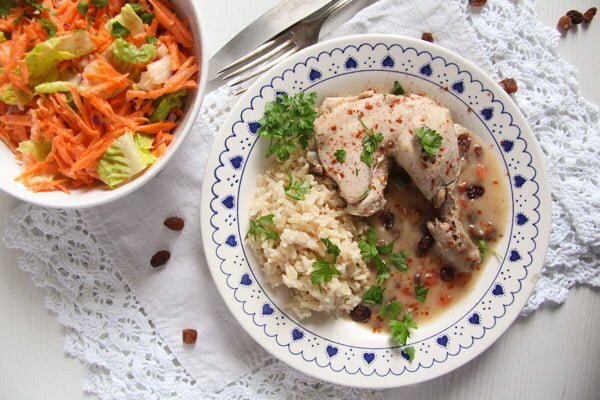 I had such a hard time getting a recipe for this particular Poached Chicken in White Sauce with Raisins and Rice! Hard to imagine as it is such an easy, straightforward recipe, requiring only few, cheap and easy to come by ingredients. I have heard of this recipe from so many Saxons living around here, actually it was the one recipe they have all mentioned when it came to Saxon cooking. Yet, not one person was able to give me a recipe, they all make it, but apparently they are all shy to spread it because they find it too simple (oh, it’s really nothing much, just boil some chicken and make a white sauce with raisins) or because not one of them actually has a written recipe, they all make it “dupa ochi” – “by eye”, so actually not following any specific instructions. And another thing they all found important to tell me was that everything should be put separately on the plate: the chicken pieces directly from the soup, the rice which is cooked separately and the sauce aside. Eventually, after a lot of insisting on my side, my friend Adela managed to get some rough instructions from a cousin of her ex-husband living somewhere in Germany. She needed to call her twice to get only a list of ingredients and a rough description of the dish. The first time she heard the same excuses I have heard from any other Saxon I have asked… But I insisted she called her again and then I finally had something. Not much, mind you, but it was a start! So, this is my interpretation of the Saxon wedding chicken with raisins and rice. 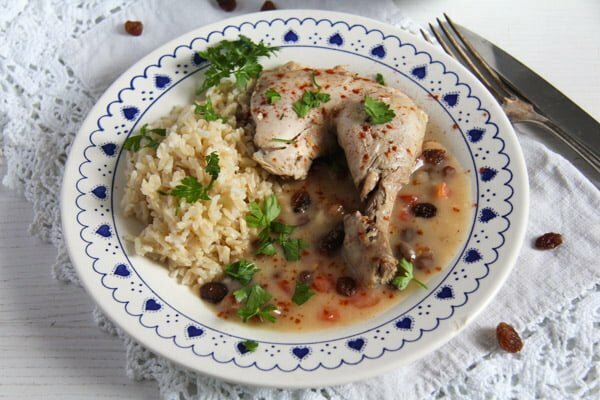 It is called wedding chicken because it is a dish that you will apparently get to eat at any Saxon wedding in Romania. I don’t know that from personal experience, but my friend grew up in a village with a very large Saxon community and she (and her ex-in-laws) said that this is a dish you will always get to eat at weddings or larger celebrations. 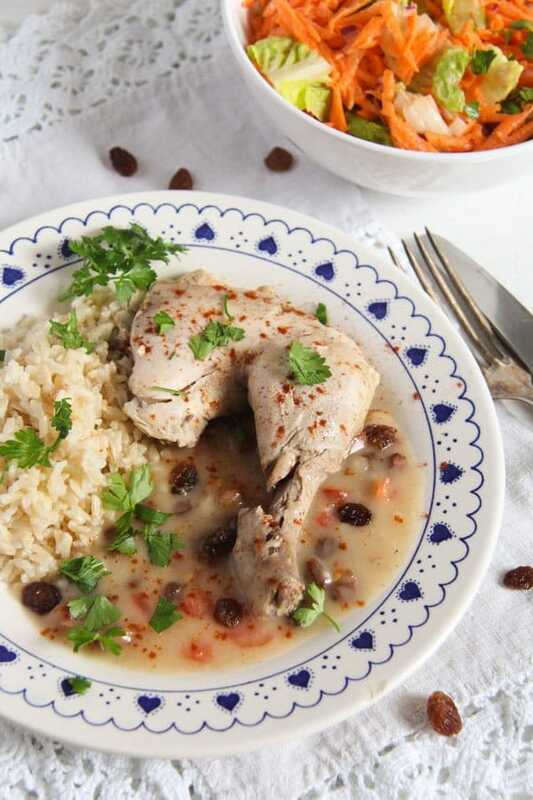 The women will cook the chickens for the obligatory Romanian Chicken and Semolina Dumpling Soup and use the meat and some of the stock to make this Poached Chicken in White Sauce with Raisins. 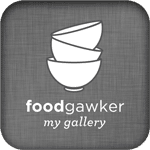 They enrich the sauce with raisins or gooseberries or a mixture of both. I had actually intended to make the sauce with gooseberries, but I was assured by many sources that raisins taste better in this particular dish. So, I used raisins as well. Put the chicken into a large soup pot. Add the halved carrots, the halved onion, the leek cut into 3-4 pieces, the celeriac piece, all the spices and salt. Cover everything with water (about 2 liter/ 4-5 cups) and bring to a simmer. Let the chicken simmer (it should never boil) for about 1 ½ hours until perfectly tender and cooked through. Lift the chicken out of the liquid and set aside until cool enough to handle. When being able to touch it, cut it into pieces and keep warm until the rest of the meal is cooked. Strain the poaching liquid and measure the amount you need. Save the rest for other uses. If the poaching liquid you will use for making the raisin sauce is not strong enough in taste you could add about ½ – 1 organic chicken stock cube to it. Melt the butter into a thick-bottomed saucepan. Add the flour and stir for about two minutes until the flour turns golden, it should not get too dark. Slowly and gradually start adding the measured poaching liquid while whisking all the time. Only give the next gulp of liquid when the previous one has been incorporated in a clump-free manner. In the meantime deseed and chop the tomato very finely. You can also peel it if you wish, but I never bother, the small peel pieces are healthy and they don't bother us at all. Give the chopped tomato and the raisins to the sauce and let it simmer for another 5-7 minutes or so. Adjust the taste with nutmeg, salt and pepper. Serve the sauce with the poached chicken pieces and rice. Sprinkle everything with chopped parsley. Use the remaining poaching liquid for other dishes like soups, stews or sauces. Such a detective you are! This sounds so delicious! I can see why they would serve it for weddings! 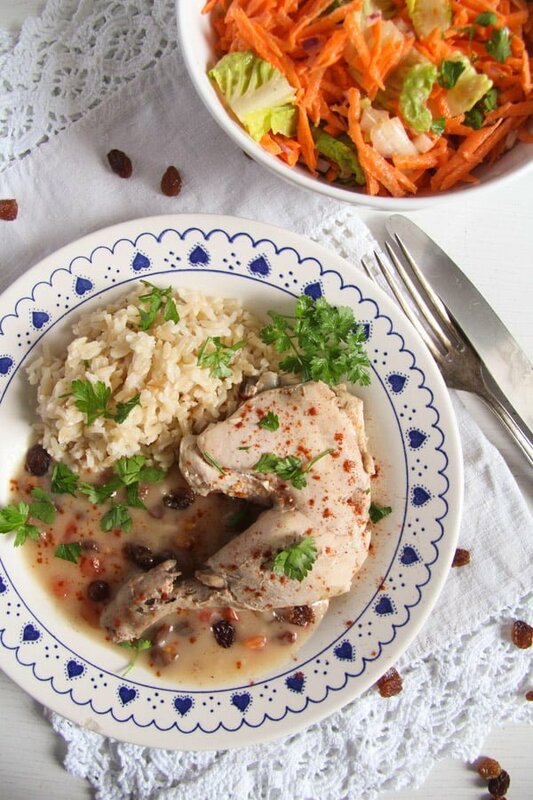 There’s so much flavor going in the poached chicken. Love the recipe! I am going to try this. A plate full of deliciousness. A great weeknight dinner idea! This dish looks so VERY delicious Adina!